Self-realization is the knowing in all parts of body, mind, and soul that you are now in possession of the kingdom of God; that you do not have to pray that it come to you; that God's omnipresence is your omnipresence; and that all that you need to do is improve your knowing. Fearlessness means faith in God: faith in his protection, His justice, His wisdom, His mercy, His love, and His Omnipresence ... To be fit for Self-realization man must be fearless. 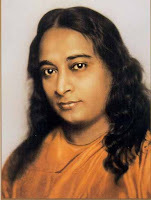 salutation of peace to the great yogi master, may God sanctify his station. You cannot reason your way into Self-realization. You cannot think your way into God-realization. power of the soul’s sixth sense. is waiting for you in God.